The carnage being inflicted this week by Israel against Palestinians in Gaza is yet the latest example of centuries old systemic European racial oppression against people of color and non-Christians. While the talking heads at CNN, Fox, or MSNBC are spending time focusing on how the establishment of an American Embassy in Jerusalem has drawn the ire of Hamas and Palestinian Authority leaders still hoping to have parts of Jerusalem declared as the capital of New Palestine, what these talking heads describe are the outward manifestations of the illness–not the root causes of the disease. Simply stated, the root of the problem can be summed up with the following analogy: Imagine that your family has owned property for centuries, only one day to learn that some other property owners from another state have decided to take over and partition your property and give it to yet other families, thus providing these new families all attendant rights in perpetuity to prevent your family from enjoying what had belonged to you. Any person who reads this analogy and concludes that they would not be irate or fight is a fool–if not a coward. Thus the conundrum that Palestinians have faced since 1948. Thus the fighting that has raged off and on since 1948. 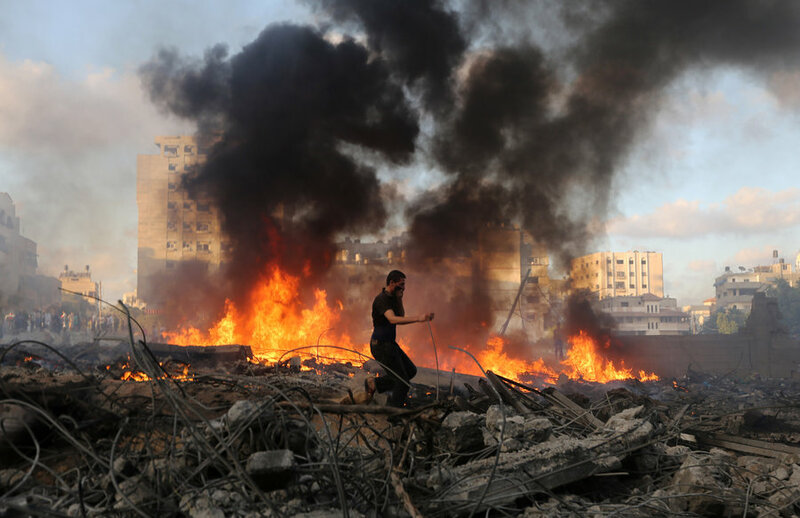 Indeed, the roots of the lopsided battles we are witnessing this week, one in which Palestinians armed with rocks are battling an Israeli Army armed with Rocket Propelled Grenades and more, harken back to the beginning of World War I. As that war raged, the British government was led by Prime Minister David Lloyd George, a man who a decade prior to the war had used his law practice to lobby for Zionist interests in Great Britain. Among those interests was the concept of securing a Jewish state in Palestine, a goal of Zionists dating back to the 19th Century. To achieve that goal, by 1915, one of the chief aims of Britain, France and Russia, the latter of which was still under the rule of Czar Nicolas II, was to defeat the Ottomon Empire, then a staunch ally of the Central Powers that included Germany and the Austro-Hungarian Empire. The Ottomon Empire at the time had control over vast segments of the Middle East that would eventually become the modern nation-states of Turkey, Iraq, Syria and Jordan, among others. By 1916, two years of trench warfare in Europe had yielded little progress in resolving the Great War. Nevertheless, in that same year, a verbal pact between the British, French and Russians known as the “Sykes-Picot” Agreement, named for British Diplomat Sir Mark Sykes and French Diplomat François Georges-Picot, laid out new borders that essentially would cede to the British control of areas that today would include Jordan, Southern Iraq and access ports to the Mediterranean via Haifa and Acre (now Israel); France was to receive control of southern Turkey, Northern Iraq, Syria and Lebanon—a nation which was to be held as a Christian nation to separate Syria from a newly created Israel; Russia was to take control of the ancient city of Istanbul, the Turkish Straits and parts of then Ottoman Armenia. Sykes-Picot never came into fruition, however, because after the 1917 Bolshevik Revolution found Czar Nicolas II deposed and later murdered along with his entire family (sans Princess Anastasia, according to legend), the Bolshevik leaders released copies of the agreement to the world press and the same caused considerable embarrassment for Britain and France. The problem, however, is that while new states were carved from the now vanquished Ottomon Empire, such borders never quite forged the sense of a national identity of “Syrians,” “Iraqi’s” or “Jordanians” as had been imagined by its condescending European colonialist architects. Nearly three decades later, following World War II, when the Balfour Declaration was made manifest as modern Israel, the rights of non-Jewish sects, particularly Palestinians, was not given any semblance of the same consideration as originally contemplated in Balfour’s letter to Rothschild. Further, barely two years after the end of World War II, the original idea of a neutral Israel, one similar to Switzerland, soon morphed into an Israel that had military forces trained and equipped by the United States, one that by the early 70′s was the dominant military force in the region replete with nuclear arms. As such, as you view the pictures of carnage below, to blame the Palestinian people for the genocidal violence being perpetrated against them by the Israeli military,requires one to provide overt or tacit approval of the same murderous, conquest oriented European designed colonial oppression that has existed across the globe in one form of another since the end of the Renaissance.